I think I’m addicted to learning. I purchased the Genius Blogger’s Toolkit in October. I’ve read a couple books and completed one course from the bundle. I’ve got many more resources to wade through, but that’s going to have to wait because I purchased EBA (Elite Blog Academy) 3.0! My major educational focus of this year is to complete EBA 3.0 by August. I love a good blog makeover. In September, I redesigned Deliberate Homeschooling. I intended to do the same for The Deliberate Mom but I lost the motivation after fixing up my other site. I’ve heard that a module in EBA 3.0 is on blog functionality and aesthetics. I will revamp The Deliberate Mom after I complete that particular course module. While I have several ideas of the way I want The Deliberate Mom to look, I want to make sure that my ideas are in line with EBA’s recommendations. This past year, I made the challenging decision to retire the SHINE Blog Hop. SHINE was a wonderful community-building platform. Unfortunately, it took far too much time and effort to maintain at the high standards I had set for it (there’s that type-a personality again). In the coming year I’ll be looking for ways to continue to build community here on The Deliberate Mom. One of the things I’ve heard from readers and friends is that they love seeing videos. So in the new year, I’ll be doing more videos, including live video on Facebook. Live video is a fabulous way for me to connect with you and for you to connect with one another. As I reported last week, I made several products in 2016. I’m launching a small product in April which compliments my Becoming a Deliberate Mom Workbook. I realized that I’ve got loads of energy when it comes to product creation, but launches and promotion are challenging. In 2017 I will focus on creating only ONE product. I have several ideas that I love right now, but haven’t chosen one yet. I plan to have the final draft of my product ready by next December. Every year, I have set goals for pageviews and unique visitors and every year, I’ve fallen short of my goal. I’ve decided to NOT make a goal about pageviews and here’s why…. I find it easy to get discouraged by the numbers. If I have a great week followed by a week when my numbers are half, it’s an emotional roller coaster. From now on, I will only check my analytics monthly. This “rule” with numbers will apply to social media and my email list as well. But I will expect growth in my top preferred social media platforms (Facebook and Pinterest), as well as an increase in subscribers to my newsletter. I wrote the eCourse, Time Management for Bloggers because I have a passion for all things having to do with organization and efficiency. I’m always on a mission to make my work time more productive and efficient. This year I want to reevaluate some of my commitments and see if I can drop blogging from my weekends. It’s ambitious but I would love to make my blog work a Monday – Friday gig. This is the scary one. I’ve been dreaming of increasing my blog income for the past three years. Hopefully, EBA will help me get the tools I need to make this dream a reality. While my income has gone up every year, I want to make this year my best income-earning year yet! This dream is daunting though. I’ve dropped Google Adsense, as well as the majority of sidebar advertising from my website (although I’ve been toying with the idea of inserting an Amazon CPM ad on my Deliberate Mom sidebar). I’ve also cut back on sponsored posts. Which means that this year, most of my income will need to come from my own products and affiliate sales. Before I reveal my income goal, I have to say that this was difficult to share. I struggled with deciding on a number. I don’t want to aim low but I also don’t want to seem “greedy”. The number I finally decided upon covers blog expenses and would give me a great base to contribute to my household earnings. My income goal for this year is $1000+ / month. So that’s it! Those are my blog goals for the new year. It’s a big list but I’m going to do it one bite at a time. I’ll make sure to report back to you next year to let you know what worked and what didn’t. 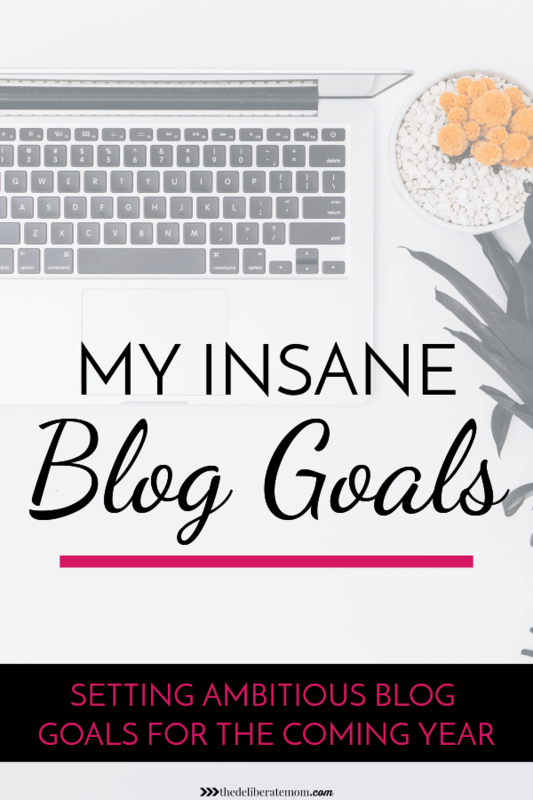 Do you have any blog goals for the new year? I invite you to share in the comment section below! Thank you for being on this journey with me. Wishing you a very Happy New Year! Thank you Janine! I’m excited about this coming year! I can’t wait to see what it brings (and yes, staying away from those numbers certainly keeps my spirits up)! Thanks for sharing! I think those are very reasonable goals. Also, checking Google Analytics only once a month is admirable. My obsessive self will be happy if I can cut it down to once a day. Personally, I’m looking forward to redesigning my site and launching a newsletter. Thank you Shannon. I’ve been trying the Google Analytics thing. I’m already thinking monthly is too tough. I may have to do this gradually… once a day, once a week, etc. Best wishes to you on your goals! I love site redesign… it’s so fun! These are all great goals Jennifer! Very ambitious, but I know you can do it. Thanks Tiffany! I’m worried they’re too ambitious but I’m going for it! You are amazing! I love all your goals too. I can’t wait to hear more about your products! These are great goals! I am sure you will surprise yourself by just how much you accomplish simply because you put it out there in the universe! If there is any way I can help you stay accountable, just let me know! Thanks Kenya! I’m excited to see what this year brings! I appreciate the offer to help me stay accountable! I’m thinking I may do periodic updates here to share my progress (rather than sum it up at the end of the year). Any tips other than that to follow through with my goals? I think that’s a great starting point. I think I am going to try to keep a running document of things I am doing and the outcome. To jump up against my goals. Also when I find my self being a busy body revisiting my goals list to see if what I am working on is in line with my goals or if I should table it to help me stay focused on what I have sought to accomplish. Great ideas! I used a Passion Planner last month to map out my goals and checkpoints – I’ll have to make sure to do that again this year. 2- I’m laughing that a lot of your readers want more video. I think I’m one of the few that *hates* video. I can read while the crazies I live with are being…well, crazy. Video, not so much. I’m delighted you enjoyed my blog goals update Julie! Yes – I was stunned that so many like video so much – it won’t take over the blog but it will be something I’m going to try out on social media – if it does well – GREAT! If not… well, one less thing to worry about. Sounds like a great income goal! I think $1,000 more a month is TOTALLY within your reach. My weekly goal is $250, so we’re the same! And for 2016, I did meet it. I have big dreams for 2017! I really need to be better about sharing content, and being more present on Instagram and Twitter. No more phoning it in! And I want to build YouTube more. I hope I can meet my financial goals for the year! I have big dreams… this year I’m going to make them happen! I have a few of the same goals for this year. I’ve been blogging for 6 years now. (Wow. Just realized that.) But only seriously the last 3 or so. I’d love to make $1000 a month, too. I need to check out those blogging courses. I’m excited about this year of blogging. I have high hopes but it’s time to make things happen! Thanks for sharing your thoughts on this Christina! Hi Jennifer! Oh my gosh, what a lovely surprise to see you at my blog today. It’s been a long time! Your blog format looks so good, I can’t believe you want to change it. But you know best, I bet if you do change it, it will be even more attractive and easy to use. I love your blogging goals, you go girl! If anyone can do it, it’s you. I remember when we first met years ago, and it’s hard to believe how far you’ve come in information, writing and earning. You must be so proud. I hope you make absolutely every single one of your goals! PS How are those little girls of yours? Probably not that little anymore! Hi Ceil! So funny story here… I posted this blog goals update but then at the beginning of January, my webhosting company had a major power outage that created issues and data loss. I lost my whole website design in the process. So I had to decide whether I was going to recreate the old look or do my site redesign several months earlier than planned. I opted to do the redesign… so this IS the new look and I’m glad you think it looks good. Thank you for your encouraging words. Yes… my girls are big. I can’t believe how fast they’re growing. Great to read your monthly goals! I love your focus on creating quality content (whether video, product,) and letting the numbers fall where they may. I’m curious why you removed ads from your blog and are doing less sponsored posts? Hi Kate! I removed most ads from my blog (I still run Amazon CPM in the sidebar) and greatly reduced my sponsored posts because I don’t want to distract away from my own content and products. I would much rather have someone purchase something I created, than have them click away only to get a small commission.